Leila Musavi, Samuel Sarmiento, MD MBA, Justin Sacks, MD MBA, Oluseyi Aliu, MD. BACKGROUND: Head and neck cancer (HNCA) reconstruction is increasingly centralized at high-volume hospitals. However, a significant patient population receives surgical care at low-volume centers, and Medicaid patients comprise a disproportionate fraction of this population. Furthermore, Medicaid patients experience higher mortality after a number of high-risk surgeries. Thus, we examined national HNCA reconstruction trends to assess the impact of hospital volume and insurance status on post-operative pulmonary complications, which are a major source of morbidity in HNCA surgery. RESULTS: From 2012-2015, 59,975 patients underwent ablative procedures for HNCA; 14,580 (24.3%) received flap or pedicle reconstruction. Hospital volume tertiles were <15,15-65, and >65 cases/year. The majority of patients were white, male, with Medicare or commercial insurance. Mean age was 62 years. Pulmonary complication rate was 10.2% in low-volume and 8.01% in high-volume hospitals. 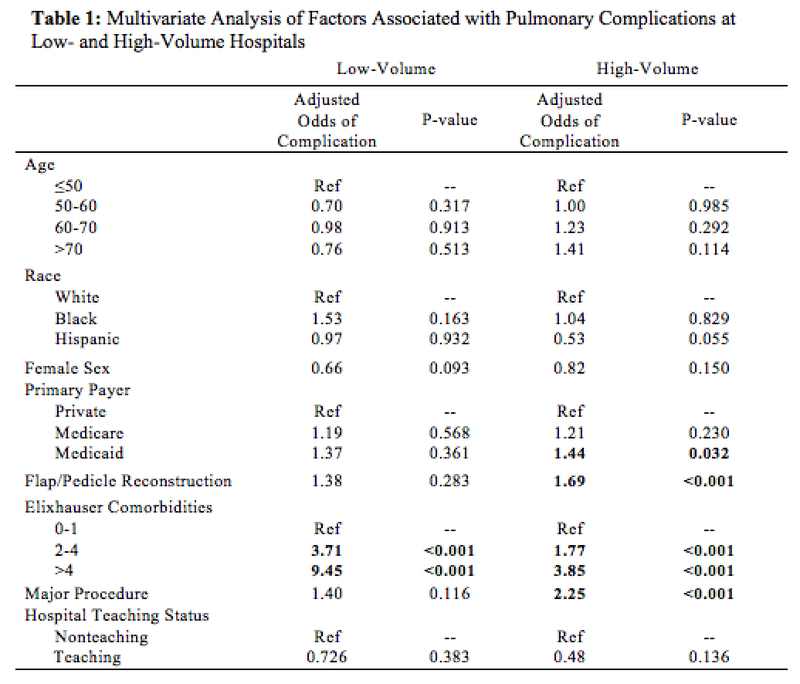 On multivariate analysis, higher hospital volume was associated with lower odds of pulmonary complications (OR 0.52, p<0.001). Pneumonia, pneumothorax, and acute pulmonary failure all had lower odds of occurrence at high-volume compared to low-volume hospitals. Regarding insurance status, Medicaid patients had higher odds of pulmonary complications compared to private payers (OR 1.31, p=0.018). When stratified by hospital volume, Medicaid patients had higher rates of pulmonary complications at both low- and high-volume hospitals. On multivariate analysis, Medicaid status was a significant predictor of complications at high-volume hospitals (OR 1.83, p=0.030) but did not reach statistical significance at low-volume centers (1.37, p=0.361) (Table 1). CONCLUSIONS: Low surgical volume and Medicaid status are associated with higher odds of post-operative pulmonary complications. Within high-volume hospitals, Medicaid patients have higher odds of complications compared to private payers; at low-volume centers, this association is not statistically significant. These results suggest that insurance status impacts HNCA surgical outcomes and that this relationship may manifest to different extents in low- vs. high-volume hospitals. Further investigation is required to elucidate the relationship between insurance status, hospital volume, and reconstructive outcomes, which will help inform policies to mitigate these disparities.